There is no special option in Kinetis Design Studio ‘New Project Wizard’ (NPW) to create a library (or archive). But it is really easy to create a library project. 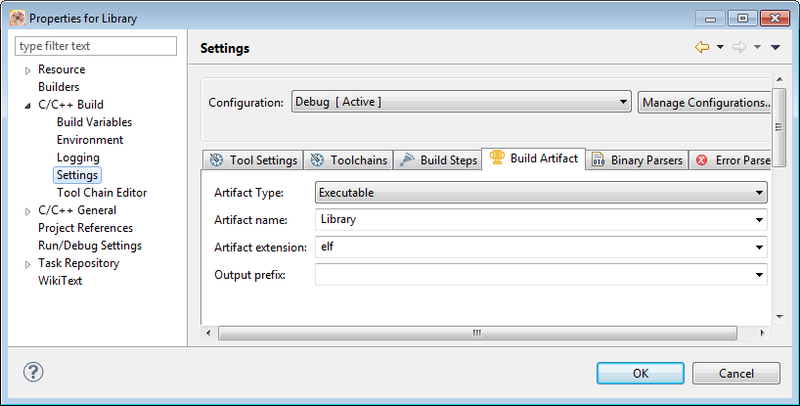 This post shows how to create a library project in the Freescale Kinetis Design Studio (KDS) (version v2.0.0 used). But this approach applies to any Eclipse based IDE using the GNU ARM Eclipse plugins. The artifact (output file of the build) extension and prefix get automatically adjusted. This concludes the settings of the project, it is really that easy. Linker Files: the library does not need a linker file, the library is a collection of object files only. Startup Code: the startup code belongs to the application, usually the library does not provide the startup code. 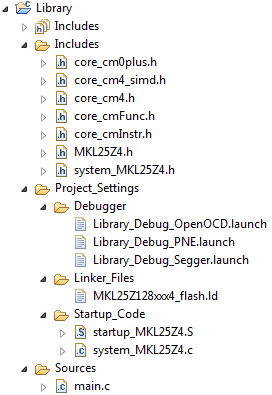 Debugger configuration and launch configuration files: we are debugging the application from the application project, not with the library project. Main.c: typically the library consists of library modules, and does not have a main(). So we can remove this file too. 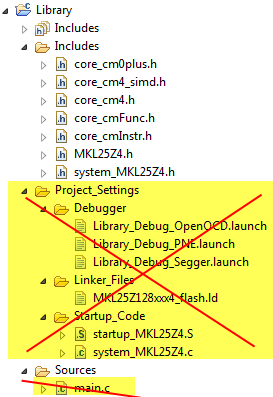 So select the above files and delete them from the project (DEL key or use the context menu and use ‘Delete’). Building the library is like building an application: use one of the Project > Build to build it. With this, I have created a library project. And I can add further files and functionality to the library. 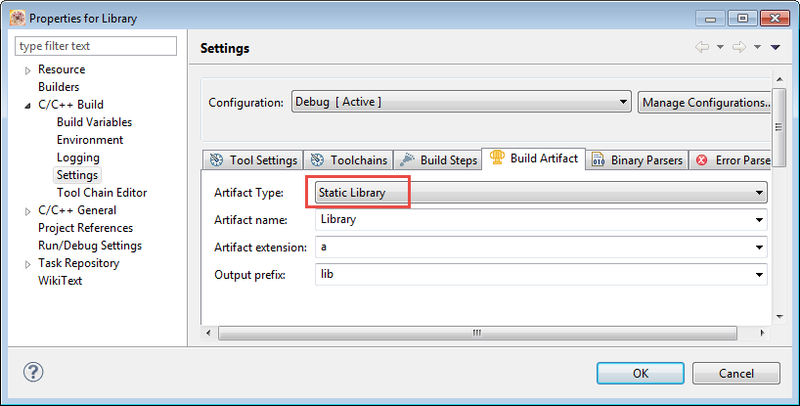 To create a library with Kinetis Design Studio, create a normal application project, change the Artifact Type to ‘Static Library’, remove the application specific files (debugger files, linker file, startup code and main()). Then I can use it as a library project. This entry was posted in Eclipse, Embedded, Freescale, KDS, Tips & Tricks and tagged Archive, arm gcc, Building, Eclipse, Freescale, KDS, Library, Tips&Tricks, tool chains by Erich Styger. Bookmark the permalink. Hey man, i was wondering: After doing this, how can i use the created library in another kinetis project? Thanks! As a student of Embedded systems i have to say that, you sir, are a life saver. Thanks a lot! Is there anything special that needs to be done when linking an executable to a shared library, rather than a static one? Thanks Erich. I was missing a tick in a box which put the “lib” prefix on the output file. All works now. yes, seen something like this. First, make sure that you build the library with the -g (default debug level) option. Second, it seems to me that your library includes constant data for the m_cfmprotrom section. Could it be that your library has included the startup code (usually the startup code has this?). It seems to me that you are trying to build a dynamic library? Are you sure you have selected a static library? No, I think this is not the only thing. Try to start with a static library created with only one file (no startup code, etc, just a single file with a single function). Then add more files. This indicates a relocation section. Make sure you create a static (not dynamic) library project. Hi Erich, I actually wanted to create a dynamic library but then common sense took over and I realised that this wasn’t possible. Doh. Static library it is. Sorry for my stupidity. No problem :-). For a dynamic library you would have to write/use a library loader in your application (which you probably don’t need/want). The great thing is that the GNU tools support this, which is very useful say in a embedded Linux environment. Less common in a microcontroller area. I’m looking for good software-based AES implementations for microcontrollers. Is the library you created here available for download? I thought I recalled seeing some AES functionality in a PEx component in an article here, but I haven’t been able to find it. 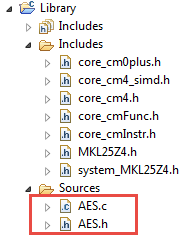 I have not published that AES library shown in that screenshot, but sounds maybe I should (if I find time)?